Businesses expect seamless Citrix services for their users, and this means 24x7 service availability, great response times and uninterrupted service delivery. To achieve this, Citrix administrators need to monitor the user experience. Just looking at CPU, memory, and disk usage trends is no longer sufficient. By monitoring the user experience, administrators can see the actual response being seen by Citrix users. A popular way to monitor Citrix user experience is using the simulation of a user accessing the Citrix farm. The results of periodic simulation highlight whether the Citrix farm is working well and its responsiveness. By checking the status of the Citrix services even when no users are actively accessing the Citrix farm, simulation of user sessions provides proactive indicators of potential problems. eG Enterprise is a purpose-built Citrix performance monitoring, diagnosis and root cause analysis solution that provides deep performance insights for XenApp, XenDesktop and all components in the Citrix stack. 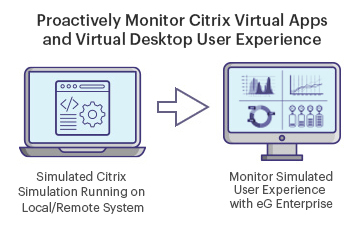 To provide a complete view of Citrix performance, eG Enterprise embeds the ability to monitor real user sessions as well as simulated sessions. The eG Enterprise Full Session Simulation for Citrix XenApp and XenDesktop goes beyond the logon stage. 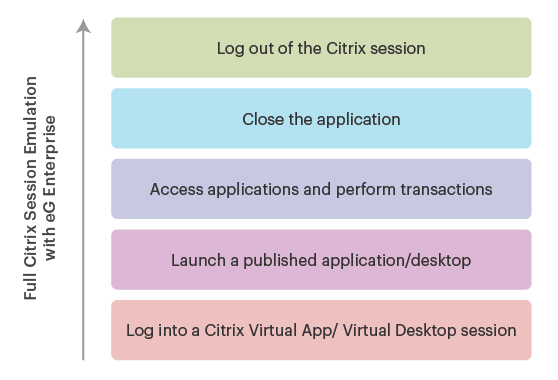 Administrators can simulate a user accessing different applications within a Citrix session, performing tasks within the session – i.e., using the accessed applications, and finally terminating the session. In both approaches, the success of the simulation, the overall time taken for the simulation, and the time taken to perform each step are recorded. These results are then analyzed to determine when and how to alert administrators to potential Citrix performance issues. 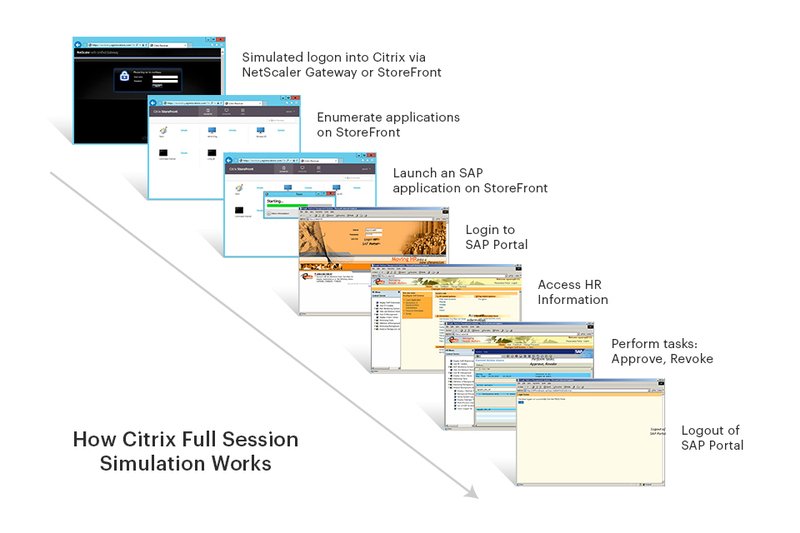 eG Enterprise simulates a real user accessing a Citrix session, and records and plays back the scenario 24x7. It uses the same client application (e.g., Citrix receiver) that real users access, and performs a sequence of mouse clicks, data entry operations and keystrokes based on pre-recorded scripts. Observing the responses at each transaction step, the eG Enterprise matches the results with expected patterns and baselines, and reports the simulation results on an intuitive web console. Based on the results, Citrix admins can quickly determine if any application accessed in a session is slow or not working. 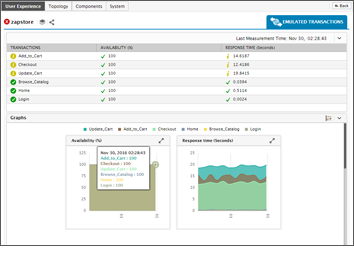 A typical example of synthetic monitoring would be simulating a user logging into an SAP application, accessing records, updating information, closing the application, and finally, logging out of the session. When an administrator is looking to understand if Citrix logons are slow and why, a Citrix logon simulator is helpful. However, there are many other aspects to Citrix user experience beyond the logon. If an administrator needs to look at the performance of a client application launched through Citrix in more detail, Citrix logon simulation is not enough. For example, an administrator may want to see if an SAP client published on Citrix can be launched successfully, if a user is able to logon to the SAP application, query the inventory, update a record, and logout of SAP in a timely manner. 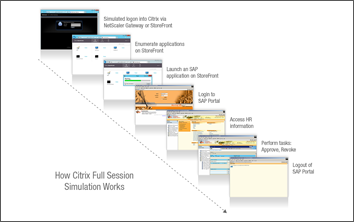 To address this requirement, Citrix full session simulation is needed. Was the published application slow to respond to a user? Which step of the application access was slow? Did the Citrix screen refresh happen quickly? Were there any disconnects during application access? 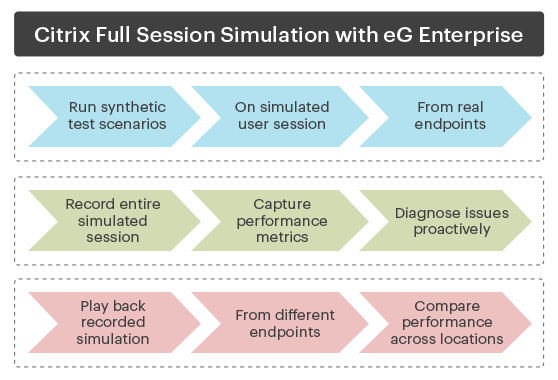 Complement simulated session performance metrics from eG Enterprise with real user logon and session performance metrics obtained from Citrix Director/EdgeSight for complete performance insight. Need to replace Citrix EdgeSight Active Application Monitoring? eG Enterprise's full session simulation capabilities provide the functionality lost when Citrix EdgeSight was deprecated.